This text presents a challenging and comprehensive survey of the music of the postwar periods. 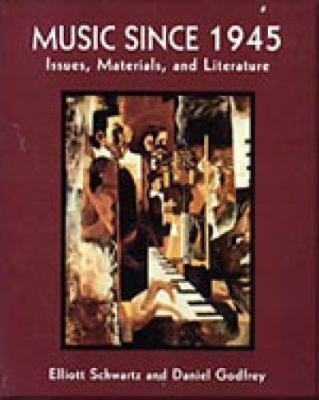 Written in a concise and engaging style, the authors encourage students to re-examine aesthetic assumptions and cultural biases as they explore the rich diversity of music in our time.Schwartz, Elliott is the author of 'Music Since 1945 Issues, Materials, and Literature', published 1993 under ISBN 9780028730400 and ISBN 0028730402. Loading marketplace prices 11 copies from $2.93 How does the rental process work?